This penthouse apartment set over two floors enjoys spacious light and airy accommodation, stunning sea views from all of the rooms and an allocated parking space. The accommodation of this apartment comprises in brief of; An entrance hallway, a lounge/diner with vaulted ceilings, a well appointed kitchen with access out on the balcony. There are two double bedrooms, the master benefitting from an ensuite shower room and a family bathroom. On the first floor is the third bedroom and a snug area with a gallery view of the lounge. This apartment is currently a very successful holiday let with a 4 Gold rating, an internal viewing is a must. A part glazed entrance door leads into a light entrance hallway, with carpeted flooring and staircase leading to the first floor, an understairs storage cupboard and a radiator. Off the hallway there is access into the living room, two bedrooms and the family bathroom. A spacious lounge/diner with vaulted ceilings, carpeted flooring, a feature open fire place, a radiator and a double glazed window to the front enjoying fine views across the valley and out to sea. Off the living space there is a door leading out onto the balcony which enjoys stunning sea and coastal views. The living room leads through into the kitchen. A well appointed shaker style kitchen with a range of wall and base units and a wood block effect work surface with tiled splash back. There is a four ring gas hob with double oven, a one and a half bowl sink with drainer, an integrated dishwasher, space for a washing machine and fridge freezer, tiled flooring and a radiator. The properties combination boiler is also in the kitchen. The kitchen enjoys stunning sea views across St Ives Bay from the Island in St Ives down to Carbis Bay beach from the double glazed window to the side, there is also sliding patio doors which lead out onto the balcony. 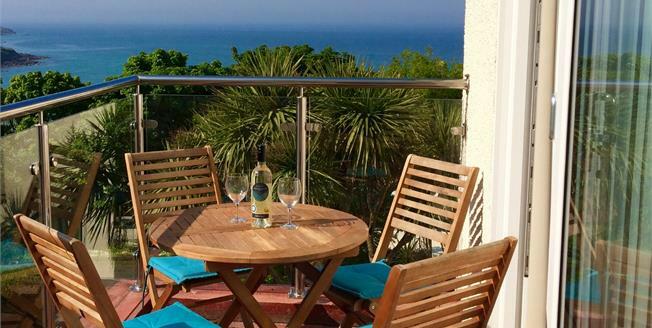 A generous balcony with tiled flooring, glass and stainless steel balustrades, this is a perfect spot for al fresco dining enjoying the fine sea view and views across the valley. A large double bedroom, with a bay window to the rear enjoying views across to Gwithian beach and Hayle Towans and a double glazed window to the side, two double built in wardrobes, a radiator and carpeted flooring. Off the bedroom is an ensuite shower room. A fully tiled ensuite shower room with a single shower with glass screen, a pedestal wash hand basin, a push button flush toilet, a heated towel rail, extractor fan and a frosted double glazed window to the side. A double bedroom with a built in single wardrobe, carpeted flooring, radiator and a double glazed window to the rear with views across to Gwithan beach and Hayle Towans. A fully tiled family bathroom with bath with shower over and glass screen, a push button flush toilet, a pedestal wash hand basin, a heated towel rail and extractor fan. The carpeted staircase leads to the first floor landing with Velux window. A further door opens into the third bedroom. A double bedroom with carpeted flooring, vaulted ceiling, a velux window and eaves storage cupboards. From the bedroom there is a gallery view of the living room as you walk into the snug area. A great snug area with carpeted flooring, a velux window enjoying stunning sea views, a gallery view of the living room, a radiator and eaves storage. Please note that this property is committed for the 2019 holiday letting season with Carbis Bay Holiday's.